New Delhi/ April 12 - The Minister of State, Home Affairs, Kiren Rijiju, inaugurated a two-day workshop on the review of the National Disaster Management Plan (NDMP) here today. The workshop has been organised by the National Disaster Management Authority (NDMA). 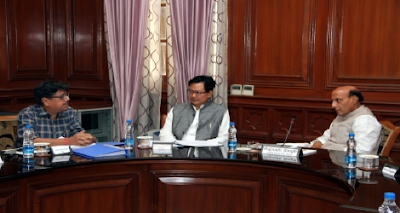 Speaking on the occasion, Shri Kiren Rijiju said that it is imperative that we integrate Disaster Risk Reduction into our governance, adding that this review would majorly guide in managing future disasters. The NDMP, India's first-ever national plan for Disaster Management, was launched by the Prime Minister Shri Narendra Modi in June last year. The Plan itself provides for periodic reviews to accommodate emerging global practices and national experiences. The Prime Minister’s 10-point agenda on DRR, outlined during the Asian Ministerial Conference on DRR in November last year, will serve as the guiding document in the revision of the Plan. Calling the review of the Plan crucial for all stakeholders, Dr. P.K. Mishra, Additional Principal Secretary to the Prime Minister, said that it was important to keep socio-economic realities and changes in mind while revisiting the Plan. In its efforts to make the review process participatory and inclusive, NDMA had sought suggestions on the national plan from State Governments and Ministries of the Central Government. Discussions at this workshop will form a part of the deliberations at the upcoming National Platform for Disaster Risk Reduction (NPDRR), which will be held shortly. Senior officials of NDMA and Ministry of Home Affairs (MHA), State Governments and Non-Governmental Organisations (NGOs) attended the first day of the workshop.